The 2017 tournament calendar is set to kick off with a bang here at the RMTC with the strongest draw in many years. The usual phalanx of Australians coming back for their Christmas holidays have been joined this year by the American contingent meaning we will have 9 of the top 11 players in the world competing on our court. In addition a few young pros from the UK and the US will be making their first trip to our shores for competition. Please come down and make them all feel welcome at our wonderful club. The first round of the main draw starts Friday 6 Jan and the final will be played on Saturday 14 Jan. In addition there will be qualifying and practice beginning Wed 4 Jan. All matches, with the exception of the singles final, will be played during the day so please take any opportunity to come down to the club and support the competitors. With so many top players competing there will be much quality tennis to watch. This first round should be one of the matches of the tournament with two up-and-coming young players looking for a good start of the year. This will of course be a return home for Nick so come down and lend him some support. The courts are closed 6am Tuesday 20 Dec to 6am Friday 23 Dec to be repainted. Thank you for your understanding. Get in quick, the specials table is starting to look a bit bare as the bargains rush out the door. There are also only 3 lesson packages left on offer, buy 5 lessons for the price of 4. Get in quick before they all run out. In recent times the club has spent $23k upgrading our gym with new state-of-the-art equipment. You are encouraged to check this out and use this as one of the many benefits of your membership. Our club is very fortunate to have loyal and dedicated staff who pride themselves on providing the highest level of service to members and their guests. 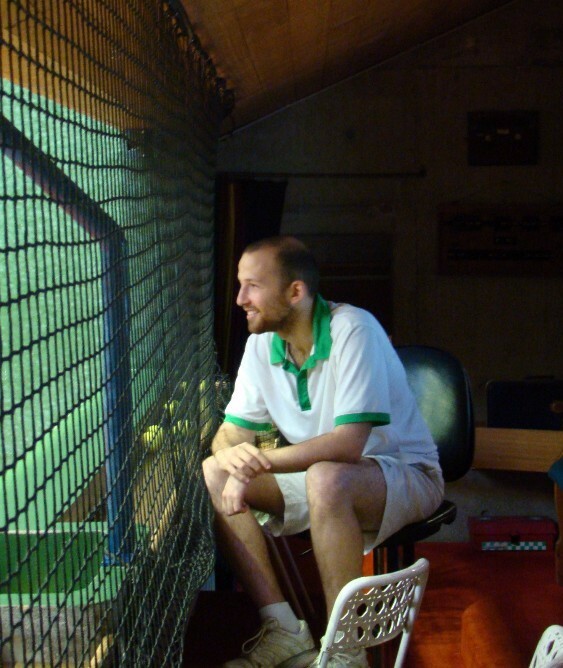 The success and atmosphere of the club is no coincidence as it is perhaps the best and most enjoyable real tennis club in the world. We urge all members to contemplate contributing to the annual Staff Gratuity Fund. The purpose of the fund is to enable members the opportunity to show extra appreciation for the efforts of the staff throughout the year. This fund is the only source from which our staff can receive additional recognition from those who have enjoyed the club. I hope you will be able to show your appreciation of their efforts by giving generously. You contribution will be very much appreciated. There has been 25 World Champions since 1750, and none better than Robert Fahey. 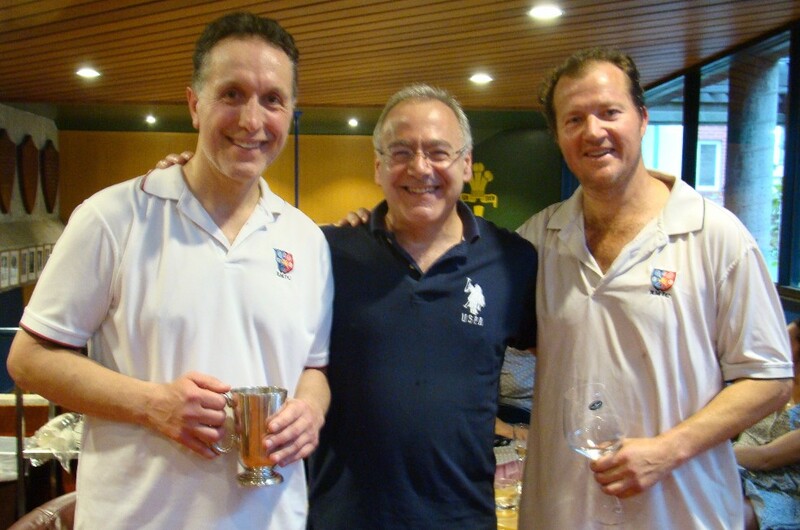 In honour of Rob’s record breaking 22 year tenure as World Champion, incorporating 12 consecutive defences of his crown, the Australian Real Tennis Association is hosting a special dinner to celebrate Rob’s achievements. This promises to be a memorable night and will be a great opening function for the Australian Open. It will be made even more special with most of the top 10 players in the world joining Rob in Melbourne for this Australian Open and event. The Jeff Bird Cup, clearly the most important event in the RMTC Calendar, was played again on Friday 16 Dec, with all the usual suspects, together with a number of welcome newcomers, as participants. 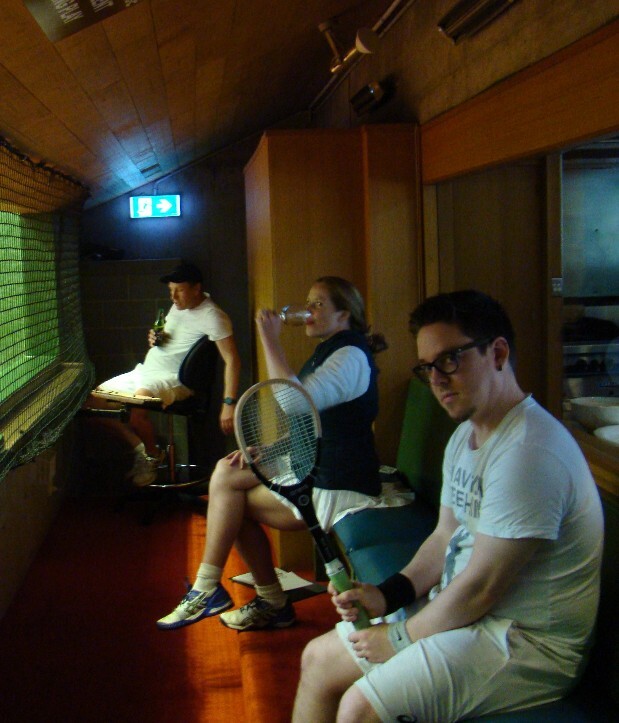 This ad-hoc Round Robin doubles tournament is played off scratch, without a draw and requires each player to play a minimum of three half-hour sets between 0700 and 0900 hours. A critical feature of the Christmas Tournament (apart from selection of an appropriate partner for each set) is the inclusion of a half-bisque, the rights to which are assigned to the receivers in the first game, and thereafter to the other pair in the next game, and so-on until Santa Sear’s monumental bell rings to end the set. The half-bisque, when claimed by loudly shouting ‘Hark’, can be used either to negate a chase, just before it is contested, or otherwise gain a point after a first fault is served. Jonathan Sear, the Herald Angel who devised this unique tournament format some twenty-plus years ago, and who was responsible for naming the Christmas event in memory of Jeffrey C Bird, also prepares the sumptuous breakfast while combat ensues on court. 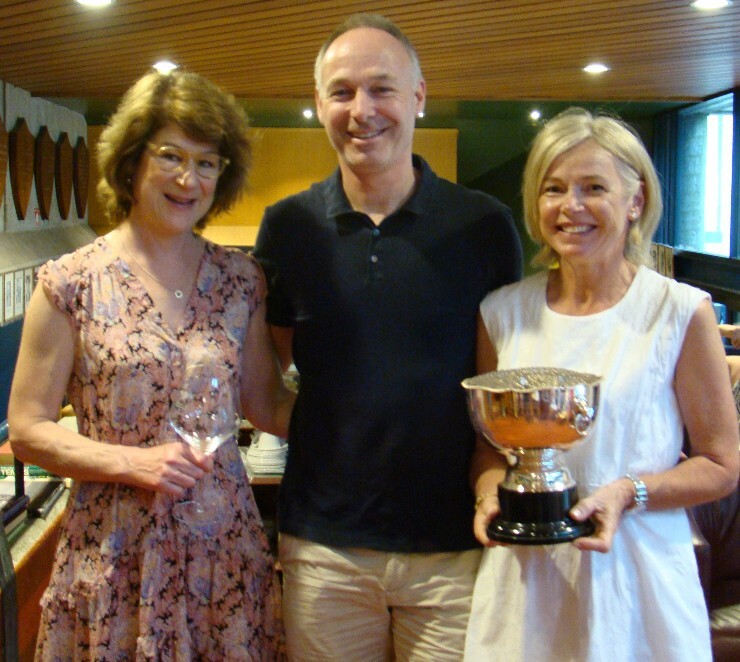 The late Jeff Bird, an ardent tennis player and a long-standing contributor to life at RMTC in all of its guises, had a happy knack of winning this tournament in the past. The winner is the player who has finished third in the list of games won, and this year, Lord Albert, your scribe, was way out in front with 24 games, followed by Lizzie Brown with 19 games, and then two players who scored 18 games. 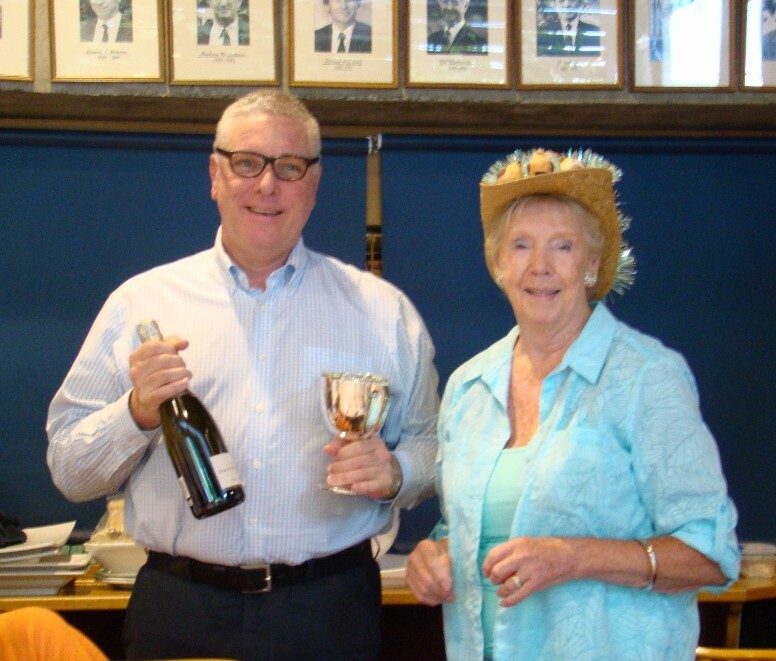 Prue Atkins and Nick Brand were therefore both in contention for this much cherished prize, being a bottle of French fizz and their name inscribed somewhere on the base of the re-purposed 1923 Birmingham sterling silver cup. As Nick Brand had fewer games scored against him, he was declared the winner of the 2016 Christmas Tournament. The Lady Elaine Bird, an elegantly attired witness to all of the proceedings on court, made the presentation to the triumphant Brand. Her speech, complete with endearing references to her late husband’s talents on and off court, was the highlight of the morning. Sear’s inimitable scrambled eggs, served with chives and exquisite smoked salmon on sour-dough toast, was thereafter taken with orange juice of dubious origins and RMTC’s legendary black coffee infusion. The Christmas Carols CD was then turned off and all and sundry left, with either ‘Hark’ or ‘Hark the Herald Angels Sing’ still ringing in their ears. Another great day in the history of RMTC. Merry Christmas and Happy New Year to all members and friends of RMTC! Don’t miss out in a couple hours RMTC Christmas Cocktail Party. French champagne, beautiful food, scintillating company. Ring the Pros. The first round of the main draw starts Friday 6 Jan and the final will be played on Saturday 14 Jan. In addition there will be qualifying and practice beginning Wed 4 Jan. All matches, with the exception of the singles final, will be played during the day so please take any opportunity to come down to the club and support the competitors. With so many top players competing there will be a plethora of quality tennis to watch. Finally billets are required for 3 of the visiting pros. They will need to be accommodated from 2-15 Jan. If you are in a position to assist with this please contact the pro shop. Any assistance with this is greatly appreciated as it helps to make our tournament more accessible for overseas competitors. The courts will be closed 6am Tuesday 20 Dec to 6am Friday 23 Dec to be repainted. Thank you for your understanding. Get in quick, the specials table is starting to look a bit bare as the bargains rush out the door. There are also on 6 lesson packages left on offer, buy 5 lessons for the price of 4. Get in quick before they all run out. Evie from the kitchen will be taking a well-earned summer break. The last RMTC Friday lunch will be on Friday 16 Dec and lunches will resume on Wednesday 8 Feb. A big thank you to Evie for keeping us well-fed through 2016! 14 players contested the second young members tournament of 2016. On the North court in the morning all but one of the matches were drawn or decided by a game with Chris Hince and James Gould coming out on top of the pool. In the afternoon Henry Batstone, in his last tournament before leaving for the French Alps, blitzed the competition to win all of his matches with Richard Endersbee coming in next. In the group on the South court the matches were also evenly spread with Edwina Happell, the birthday girl, starting slowly but easing into the day to finish on top of her pool with Julia McCahey and Dafydd Camp also making it through to the finals. Due to unforeseen circumstances, namely not paying attention to the draw, James Gould was unable to make his final so Mike Williams stepped up as the player with the next best percentage. Henry, Julia and Edwina all had convincing wins in their quarter finals with Chris also scraping his way over the line to make his semi final. Edwina continued her destructive ways taking her semi final over Julia 6/1. Chris again managed to crawl over the line against Henry 4/3. 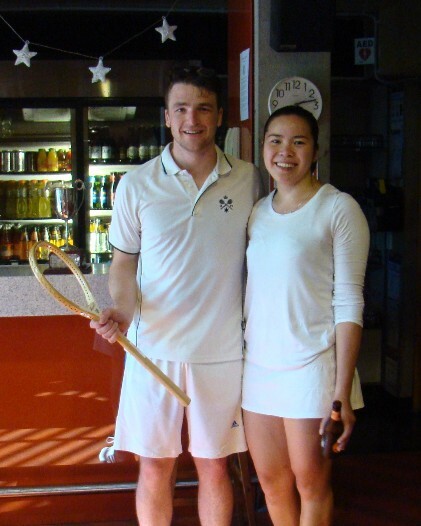 The final between Chris and Edwina was another tight affair from the start, the rec 30 – owe 40, 1 serve, banned tambour handicap keeping the crowd in raptures and leaving Chris very little margin for error. The games went by and eventually, some would say inevitably for Chris, the score made its way to 5/5, adv. all. Having set a 1-yard chase and serving for the tournament, some would say that Chris was right to be confident. Edwina was having none of it however and promptly returned his serve with a lob that would have beaten the chase making Chris play one more backhand. By all accounts the ball was struck beautifully and raced low over the net to a terrific length to meet perfectly … the base of the tambour. Congratulations to Edwina on her win and for playing terrific tennis all day. Many thanks also to everybody who came down to play in or just support the tournament, it was wonderful to see the club full of young members. Finally thanks to Paul Rosedale for his efforts during the day and more so for organising the food after play, it was well appreciated by all involved. Coming straight off an evening of celebrating the under 35 tournament on Saturday, six bleary eyed young members commenced the Jim Bailey cup with a round robin on Sunday morning. Each playing three 25 minute matches to decide the finals draw. There were some great match ups in the round robin and excellent tennis to be had. The first semi final was between Jackson Brand and Sarah Butler. Jackson played an extremely composed game of tennis that saw him progress to the final. In the second semi-final Edwina Happell got off to an early lead but Jo See Tan found something extra in the tank and stormed back to win 6/5. The final was a close match between Jo See Tan and Jackson Brand, attended by a small but very enthusiastic crowd and marked by the fantastic Paul Rosedale. An exciting match that eventually came down to five all, with Jackson claiming the win. Don’t miss out next Wednesday night on the RMTC Christmas Cocktail Party. French champagne (is there any other sort?! ), beautiful food, scintillating company. Sign-up sheet on the notice board or call the Pros. The first round of the main draw starts Friday 6 Jan and the final will be played on Saturday 14 Jan. In addition there will be qualifying and practice on the days preceding beginning Wed 4 Jan. All matches, with the exception of the singles final, will be played during the day so please take any opportunity to come down to the club and support the competitors. With so many top players competing there will be a plethora of quality tennis to watch throughout the whole tournament. Finally billets are required for 6 of the visiting pros. They will need to be accommodated from 2-15 Jan. If you are in a position to assist with this please contact the pro shop. Any assistance with this is greatly appreciated as it helps to make our tournament a possibility for more overseas competitors. Christmas specials are now on in the pro shop! We have 5-lesson packages and racquet packages as well as books, clothing and footwear. The young members weekend is on again soon, come down and join us for a fun day of tennis and a BBQ and drinks for all members U35 on Saturday 10 Dec. For those U26 we also have the Jim Bailey Cup, the Junior Club Handicap Championships, on Sunday 11 Dec. Call the pro shop or come into the club to sign up. The Christmas Breakfast Tournament (7-9am) is a great way to warm into the festive season with a spot of tennis and breakfast before work. Please contact the pro shop to sign up. The Roo Trophy is coming up and we have a number of international entrants this year. Entries close at midday Friday 9 Dec so if you’d like to play get in soon to make sure you don’t miss out. We urge all members to contemplate contributing to the annual Staff Gratuity Fund. The purpose of the fund is to enable members, who individually wish to do so, to show their appreciation for the efforts of the staff throughout the year. All those who attended finals day last Sunday were treated to a wonderful day both on and off the court. The warm day proved to be a great omen for some of the hot tennis that we were fortunate enough to witness. Thirteen players who had won a quarterly medal event through the year made themselves available to compete on finals day. The first round saw some very close games with Kathryn Arndt going down 6/5 to Will Fowles and similarly Roger Wood wining 6/5 over B Craig. 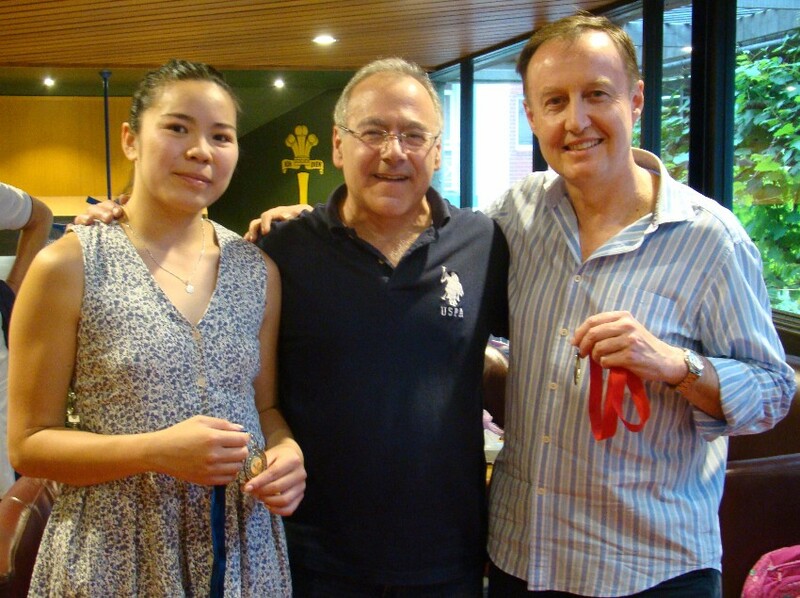 Jo See Tan progressed to the final with strong wins over Colin Scott and Roger Wood. She faced the ever-improving Tim Raw who scraped his way into the final on one leg (alleged calf soreness!) with a win over Jeremy Hawkins 6/4. Tim started the final very strongly but Jo See made a good comeback only to eventually fall short to the newly crowned handicap bandit – final score 6/4. Congratulations to Tim and Jo See. Prue McCahey came up against her nemesis the feisty Rose Blanden. We witnessed an incredibly tight match between two wonderful players in very good touch. The first set was won by Prue 6/5 after she hit two unplayable balls to finish the set much to Rosie’s anguish. The second set was a repeat of the first with some great tennis and a very tight game but Prue was able to hold on and eventually win 6/3. Congratulations to Prue McCahey for her win and to Rose Snell for making her earn it. This final was played between two very experienced juniors, Michael Williams and James Gould. Michael was in good form and was able to win the game 6/1, 6/4 against some very good opposition. Congratulations Michael on your strong win. 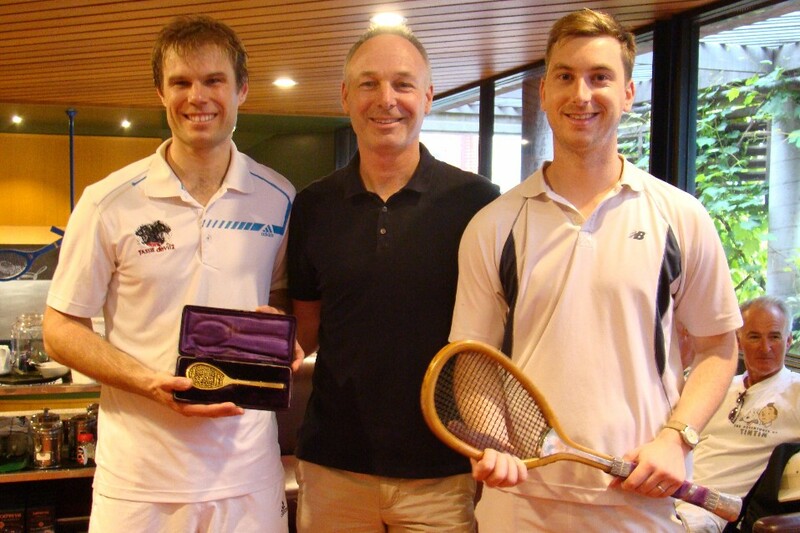 Fresh off a strong four set win over Michael Happell, which ensured that he would at least retain his Silver Racket title, earlier in the week Daniel Williams challenged the all-conquering Gold Racket title-holder Kieran Booth. Unfortunately for Daniel, it was clear from the outset that Kieran was in training for the Australian Open so he was in excellent form. Daniel played some wonderful tennis but Kieran’s strong service game along with his powerful volleying and incredible court coverage and control made it extremely difficult for Daniel to apply any pressure on Kieran. 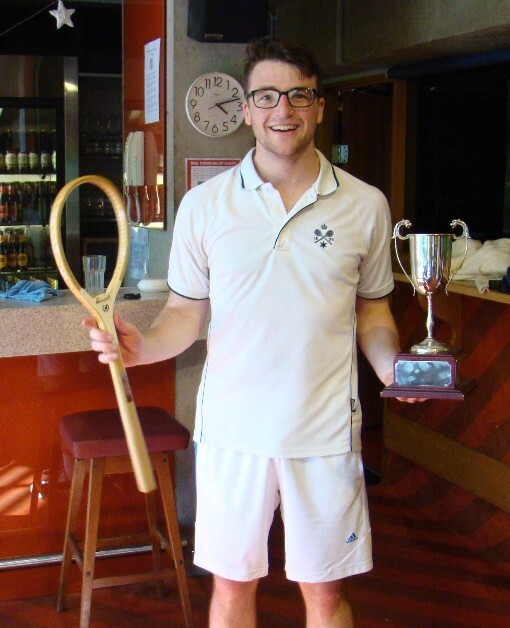 Congratulations Kieran for a wonderful display of real tennis winning the 2016 Gold Racket 6/1 6/2 6/1. Also congratulations to Dan for retaining the Silver Racket title. 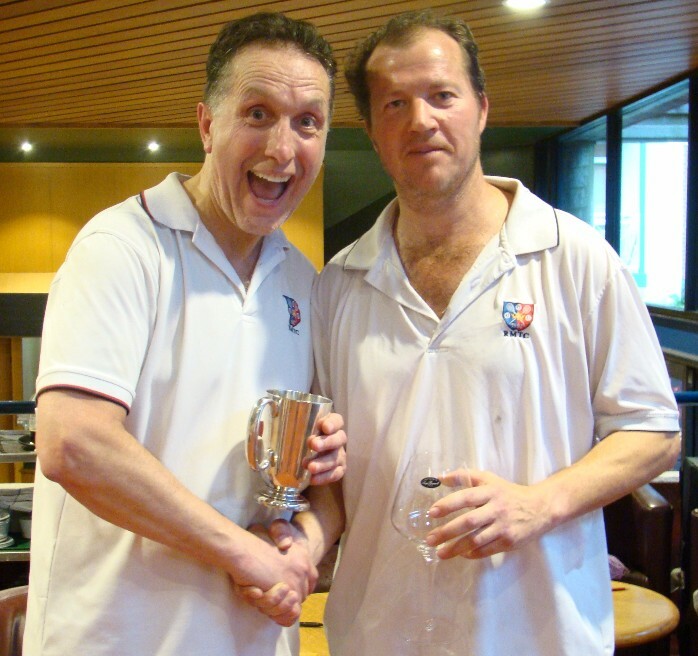 After surviving a up to 5 or 6 rounds of knockout games with players having all sorts of handicaps over the year the last two standing to make the final of the Poolman Trophy were John Piccolo and Adam Whitford. It was clear from the outset that neither opponent knew each other prior to the final so both had no idea about each other’s game. John settled better from the start and was 5/0 up in the first to 9 games set. After this the game turned and Adam started to work out John’s game and he started to display the sort of tennis which undoubtedly led to him making this year’s final, playing some incredible tennis that entertained very appreciative audience in attendance. The pressure built with the game score moving inevitably to 8 games all with many believing that Adam had all the momentum and the wheels had fallen off John’s game. The 9th and final game was very tense with both players making some early errors but it was John who secured the serve and this seemed to prove crucial as he went on to win a very tight game. Congratulations to John for the win, and Adam for making this such an entertaining final. Thanks also to Julian Snow for marking this game under some intense crowd pressure – he marked impeccably as is his trademark. Thanks also go out to the pros for helping make this such a wonderful day and to Lizzie Brown and Paul Andrews for providing such great food to feed the good crowd in attendance on Finals day. The 2016 J.B. Box Trophy, between teams representing the Solicitors and the Bar & Bench, was played on 3 December 2016. The Trophy, donated by Murray Kellam, a former judge of the Court of Appeal, is named after John Burnett Box, the first man to sign the Bar Roll in Victoria, a judge of the County Court and the winner of several Gold Rackets at the Exhibition Street court. The Solicitors had dominated in the early years, but recently competition has been much closer, with the Trophy changing hands each year since 2012. This year was no exception, with the Bar & Bench being unable to retain the Trophy and losing by the narrowest of margins, three matches to four. 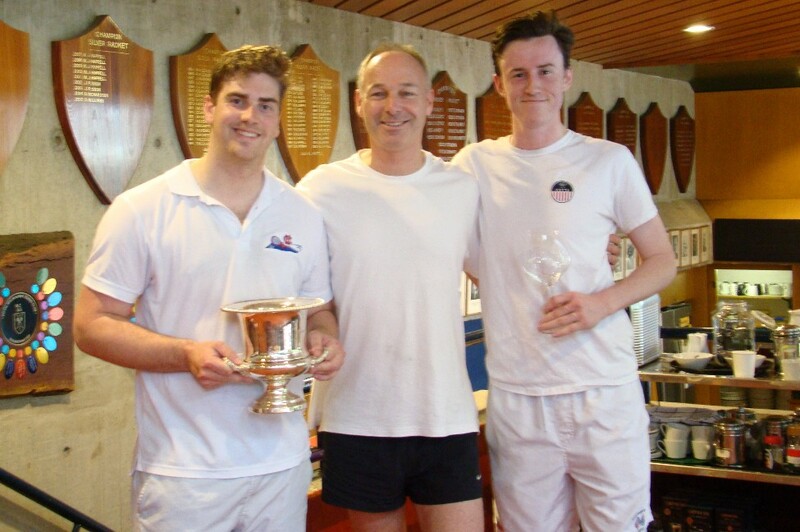 Claire Heughan and Chris Blanden shone for their respective teams, winning two from three matches, while Julian Snow outlasted Rose Snell in a match containing the morning’s most elegant tennis. The Hon. Justice (Jack) Forrest of the Supreme Court presented the Trophy while sharing some interesting history about his grandfather, Dr H.S. ‘Bronco’ Forrest, winner of the Silver Racket in 1931. A delicious lunch was enjoyed outdoors, at which many stories of courts and Courts were told.